Our school curriculum has been developed to be innovative in its design, inspiring for our pupils and impactful on learning. being ready for Secondary school both academically with reading, writing and mathematics and socially having supportive friendships. learning the skills needed along the way. We have turned the school’s curriculum on its head – looking at how teaching supports our vision instead of looking how to fit our vision around the curriculum. This important distinction allows us to reflect on where our children’s needs are and act accordingly, working from where the children are at. Our curriculum has been designed with a determination to provide a full, rich and broad experience in learning which is customised for our pupils at Nailsworth School. The context provides a focus for learning and is designed to be impactful. We use our wide range of amazing facilities to give our pupils regular, systematic, real-life, hands-on experiences. Coupled with learning facilitated through strong links with the local community, we provide a breadth of experience that prepares children for later life. 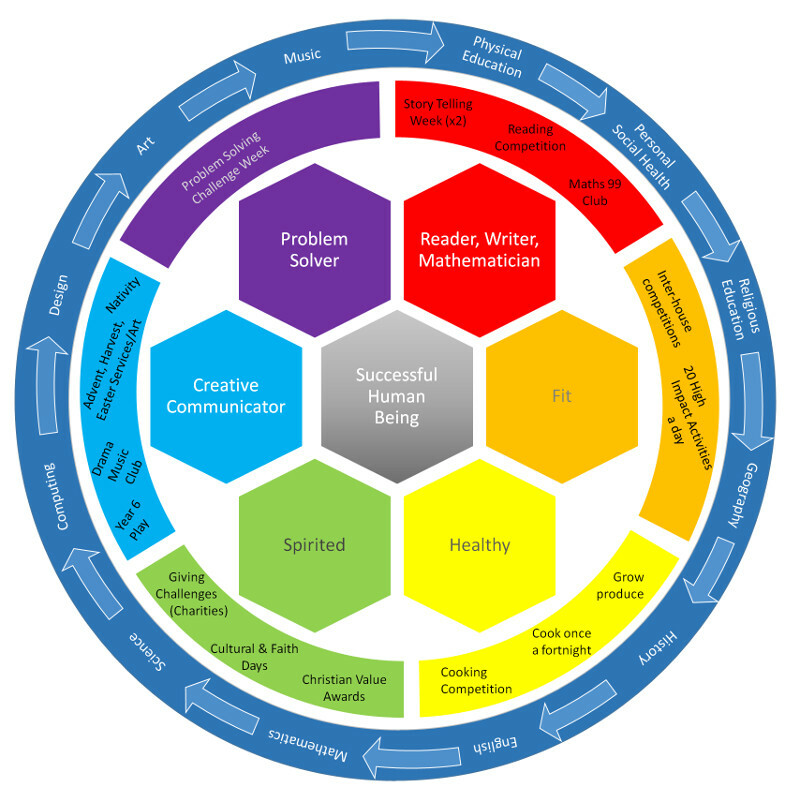 The skills to support the journey of learning are drawn from the National Curriculum and may be taught in a themed or subject specific manner but the aim is always to develop successful human beings. Our approach is based on themes, where possible, that inspire and engage children in their learning. This focus will ensure that Literacy and Numeracy are integrated across the curriculum. Information about the themes come home with your children from school at the start of each term. Each theme is taught in continuous provision. This means that a theme is explored in depth and children can participate in independent and on-going work, planned by the teacher in order to give them a really deep understanding of a subject area and the opportunity to develop associated skills. Our aim is to ensure that every child has a secure foundation in the basic skills of grammar, punctuation, spelling, reading, comprehension and handwriting and that they can appy these skills across a range of genre and other subjects. We place great emphasis on the teaching of reading, with the goal that each child should be able to read fluently and accurately with understanding and enjoyment. The school uses a clear reading programme, drawing on a range of published schemes and other materials. The school Library provides for further reading development. By making Mathematics an enjoyable and exciting subject, children can learn with confidence and understanding. Children are given a firm base in the traditional skills, as well as being provided with practical applications and areas of expertise. Visit our R.E. page to read all about how R.E. is taught at Nailsworth Primary School. We work alongside St. George’s Church, Gloucester Cathedral and other local churches to make Christianity on accessible, challenging and reflective learning opportunity. Collective worship is an important part of our daily assemblies and the children enjoy worship through song. We provide children with the opportunities to become independent computer users able to work with a range of common computer programmes, from work processing, spreadsheets, and presentation software through to composition of music and film making. Our approach is to teach skills withing ICT lessons and then give children the chance to use the skills, where appropriate, across the whole curriculum. Children have access to classroom computers every day and laptops are scheduled in the classroom every week. We encourage children to explore and learn more about their environment through activities and develop their ability to observe, question, investigate and record discoveries. We are keen to encourage enquiring minds and a scientific approach to problem solving. Children are taught a variety of skills, which involve working with a range of different materials and foods using appropriate tools. They are encouraged to undertake practical solving of problems. Children develop geographical skills, including map work, gain knowledge of local and distant places and understand environmental phenomena such as weather. Various methods of activity are encouraged including practical and technological, with an emphasis placed on first hand experience where possible. Historical resources and visits are used to encourage children’s interest in significant historical periods. Children learn to make simple use of evidence and develop an idea of both the distant and more recent past. All pupils take part in singing practice and are introduced to a variety of music making activities. Many inspiring musicians visit the school and children take part in various concerts. Additional music tuition is organised for those children who would like to learn an instrument – e.g. recorder, guitar and drums – and there are opportunities for children to perform in assemblies and concerts. Children are presented with a variety of experiences and materials to develop their artistic skill and appreciation. Basic techniques of 2D and 3D working are taught and developed throughout the school. These are incorporated in topic work and big art displays. Artists regularly visit the school for specific projects and exhibitions. Visit our P.E. page to read all about the wide range of sporting activities our children have the opportunity to take part in at Nailsworth Primary School.